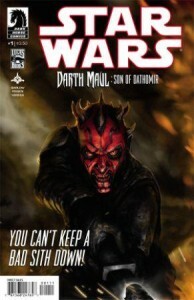 Cover of "Darth Maul: Son of Dathomir"
With the release of the first of four issues of “Darth Maul: Son of Dathomir” due out in nine days, Dark Horse has released the cover art and first several pages of the issue online (h/t SWU). While this is enough to whet one’s appetite, it is actually quite curious. From what little we see, it seems that some Mandalorians actually free Darth Maul from some sort of Separatist/Droid jail/prison/holding place. Clearly, this has got something to do with Lord Sidious taking him into his control in the fifth season of Star Wars: The Clone Wars, although we don’t know what it is. It also raises questions such as why did Lord Sidious put him there? and how come there are Mandalorians freeing him from there? What’s in it for them and did it have anything to do with his time taking over Death Watch in season five? 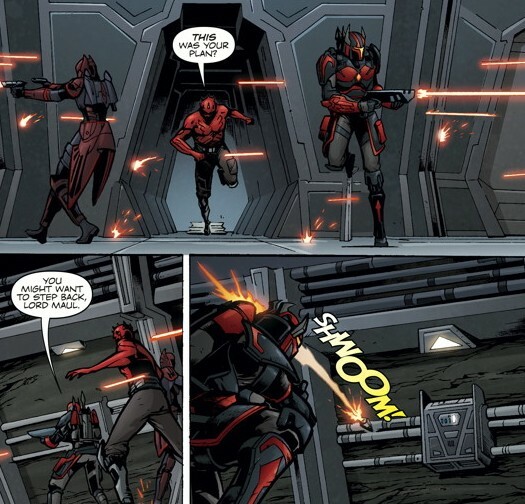 We’ll have to wait to see, but I am excited for the continuing saga of Darth Maul….